The Codex European region comprises 52 countries with widely diverse economic, historic and climatic backgrounds as well as differing levels of experience in engaging with Codex. Many countries in the region joined Codex in the early 1960s at the birth of the Codex Alimentarius and some, especially from the East European region only became members since 2000. One of these is Kazakhstan, a Codex member since 2003, now leads the region as Regional Coordinator. From 4 to 8 February 2019 a Codex delegation from the Republic of Kazakhstan made an official visit to the Republic of Belarus and Ukraine on a country capacity building mission. The National Codex Coordinator from the Netherlands, Marie-Ange Delen, joined the Kazakh delegation for the visit to the Republic of Belarus. 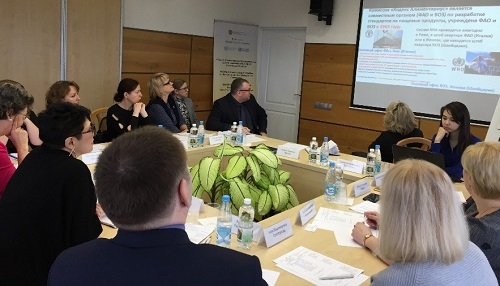 The Kazakhstan Codex team participated in the round table at the Scientific and Practical Centre of Hygiene in Minsk. The Deputy Minister of Health, Chief Sanitary Doctor of the Republic of Belarus, Natalya Zhukova, gave a welcome speech on behalf of the host country. Participants discussed Belarus participation in the development of international standards and other Codex areas of work. Those present were interested in practical aspects of participation in the work of the Codex Alimentarius Commission, its committees, as well as the application of Codex documents in the work of The Eurasian Economic Union. The Kazakh team took part in the round table on the role of the Codex Alimentarius in food safety, held at the Scientific Centre for Preventive Toxicology, Food and Chemical Safety, “L.I. Medved” in Kiev. Ukraine shared experiences, in particular the mechanism for enshrining in law the function of the National Codex Committee. “These visits to countries in the region allow us to work together to increase the capacity of all interested ministries, agencies, food producers and other stakeholders in the work of Codex”, said Nailya Karsybekova, Regional Coordinator for Europe.